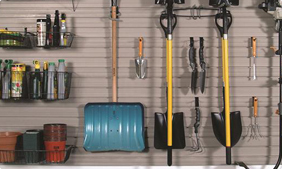 Our Custom Storage Cabinets provide an attractive and durable organizing system for your garage. 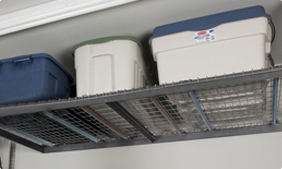 Our overhead storage racks provide storage for those items you don’t use on a regular basis. 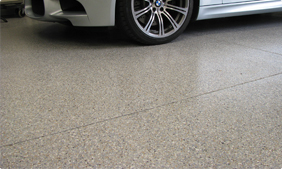 As the experts in garage flooring and organization, our team has transformed garages into beautiful, efficient spaces utilizing high quality industrial grade garage floor coatings, ‘real’ garage cabinets, and organizer systems along with years of garage innovation expertise. We use only the highest quality materials, construction methods, and professional installation procedures to achieve the best results. Our custom cabinets include various finishes like stainless steel, chocolate apple, maple, and colorful European-style contour cabinets. Find out why our clients are repeat customers and refer new customers and see the difference in our quality products and high service. Our garage makeover started out as a surprise for my husband, but it made an impression on our lifestyle & home as well. We are now able to use our garage for storage space and for our family & friend gatherings or as an additional room. We can even park our cars on a beautiful floor every day! 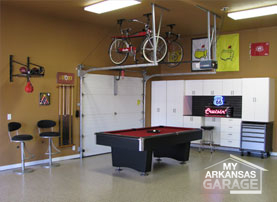 My Arkansas Garage completely helped me to re-think my garage. Thank you for your professional & quality work… We are very pleased! 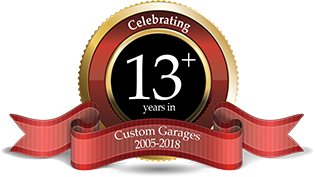 In 2011, we incorporated NWA Garage Solutions (Northwest Arkansas Garage Solutions) with My Arkansas Garage to better reflect our wider service area that covers Northwest Arkansas and Central Arkansas.